Ick, Ich, White Spot, White Point Disease. 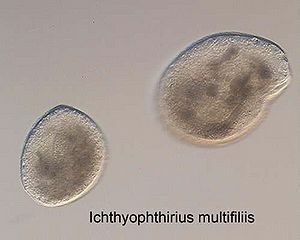 The parasite species is named Ichthyophthirius multifiliis. This parasite is very common. Tiny random scattering of white spots on the surface of the skin or gills of fish, resembling grains of salt. Ich burrows into the flesh of the fish causing increasing skin and gill damage as the parasite multiples. If the gills are seriously infected the animal can't breath. In small numbers, ich is only an annoyance to fish. With a large enough concentration, ich may weaken a host enough to cause secondary infections, or may kill the host outright. This parasite goes through several life cycles and it is only when the parasite transforms into the free swimming cyst (trophont) stage can it reproduce and infect other fish. Ich when in the free swimming 'cyst' stage need to find a host fish within 55 hours or it dies. When it finds a fish (usually through the gills) it lives in the host for about 5 days* at 25°C (77°F) and can be seen as white spots as it ruptures through the skin. It then drops off and sinks to the substrate where each parasite develops into around 1000 more cysts which in turn swim looking for a host fish again. *This time scale is dependent on the water temperature, lower temperature = more time at this stage. Very. Passes rapidly to other fish via water. 1. Raise temperature of water slowly over a day to 30°C (86°F) and leave for a week. When the parasite leaves the host in search of a new host, it will be killed by the water's temperature. With this treatment the cyst is killed during its free swimming stage, this will not kill already attached parasites however. 2. Continue treatment for at least 3 days after the last spot has disappeared to ensure complete elimination. Optionally add an external antibacterial agent to stop wounds caused by the Ich from being infected. Slowly reduce the water temperature over a day back to the fish's normal temperature. Stresses fish not used to high temperature. Some plants will not like the high temperature. Higher temperature increases toxicity of Ammonia if present. Ensure you have none. Lowers oxygen content in water so a tank loaded with lots of fish may causes oxygen starvation. :*Extra aeration is advised. A few species of Ich in USA have appeared that can survive up to 33°C (91.4°F) . Along with temperature, salt is one of the oldest treatments for ich. Ich is susceptible to concentrations of salt beginning at a specific gravity of 1.002, and is much more sensitive to these concentrations than most fish are. Salt is a known stressor to many fish, and can be extremely dangerous to some, particularly scaleless fish. This parasite is so common that virtually all Pet shops sell a White Spot or Ich cure. These use chemicals to kill the creature when it's in the cyst stage. Therefore you have to constantly add the chemical every day for at least 8–14 days. The usual chemicals for treating Ich is typically Salt (3% solution), Copper sulphate, Formalin (25 mg/l), Potassium permanganate and malachite green (0.2 mg/l). Allows fish and plants to remain at a safe temperature. Needs to be correctly dosed. Too little and it doesn't work. Too much and you harm the fish. You need to remove any Active Carbon filtering material from your tank as the carbon removes chemicals from the tank, possibly before they have been effective. You need to lower light levels as malachite green is photosensitive. Stresses scale-less fish like Clown Loaches, all species of corydoras, and many Plecos. Can potentially kill many invertebrates in both fresh and salt water. Aquarists are beginning to report of chemical resistance strains of Ich. After either treatment method your fish will be wounded by the holes left by the Ich and the stress from heat or the chemical used and this can cause death. To prevent secondary infection by bacteria it is recommended to keep the water quality up by performing regular water tests and replacing 25% of the water if necessary for 2 weeks afterwards as this will reduce the bacteria and if you wish you can add any typical fish wound treatment commercial treatment sold. 1. It has been noted that Ich seems to only appear when fish are stressed. This is due to the fact that the parasite, which is present in most bodies of water, including aquaria, can more easily infest stressed fish, whose immune systems are weakened by the stress. 2. Ich is only transmitted by water. It can not be transferred by air. Though it could be transferred by the Aquarist from one tank to another via water drips on hands or equipment. It is always a good idea to quarantine new fish and plants. Alternatively, plants may be given a dip with a mild bleach or potassium permanganate solution in order to remove bacteria and pests. It is worth noting that some plants are sensitive to bleach, and thus require either quarantining or the alternative potassium permanganate dip. 3. Early infections can go unnoticed as the Ich tends to populate the gills first. This causes the fish to try to scratch the parasite by rubbing against objects. 4. It is debatable if amphibians can get Ich. Most aquatic frog keepers have never seen their frogs infected. Perhaps because aquatic frogs like the DAF or ACF have a thick keratin skin which appears to make them immune. But there had been cases where tadpoles (which haven't yet developed this thick coating) have been deliberately introduced to high density of Ich parasites and have become infected. 5. Recently discovered that Ich is populated with bacteria (Flavobacterium columnare (aka. Mouth Rot)) which assists its attachment to the fish. ↑ Whitespot parasites contain symbiotic bacteria . See paper Sun, HY, J Noe, J Barber, RS Coyne, D Cassidy-Hanley, TG Clark, RC Findly and HW Dickerson (2009) Endosymbiotic bacteria in the parasitic ciliate Ichthyophthirius multifiliis. Applied and Environmental Microbiology 75, pp. 7445–7452. This page was last edited on 19 February 2018, at 17:30.